The Jarul Book Award is a one-of-a-kind award in Asia that honors Indian authors of contemporary children's picture books. As a true children's choice award, it empowers 5-11 years of age of children to review, select, nominate, and vote for the most outstanding English picture book of the year. The American School of Bombay (ASB), in partnership with Ascend International School and Don Bosco International School, initiated the Jarul Book Award in 2016. 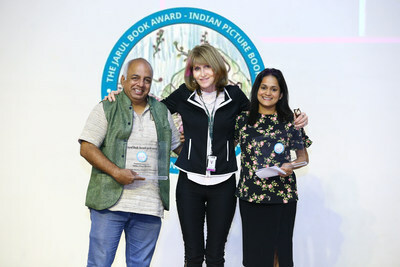 Three committed librarians, one from each school, had the vision to salute the finest of India's picture books by involving children to nominate the best author and book; being a democratic process, it is voted upon by only students. What started as a small but determined initiative with the participation of just three schools, has now spread to 23 schools. This year, the Jarul Book Award also established itself in the United States, with the participation of the University Child Development School, Seattle. Almost 6,000 votes were cast by national and global children to review, nominate, vote, and award their own choice for the best Indian picture book. In the 3rd edition of the Jarul Book Award, held at ASB on the 18th of January, Nalini Sorensen won the award for the second time in a row, this time for her book, 'Papa's Marathon.' The event began with Mr. Craig Johnson, head of the American School of Bombay, engaging the students and teachers with an absorbing narrative on the origin of the award. A lively writing session followed, where the students wrote how they felt connected with the nominated picture books on leaves and flowers made from colored paper and these were glued on the cut-out of a 'reading tree'. After the students' interaction, the principals and librarians were recognized for their contribution in bringing this award into fruition and students were also felicitated. Bringing in an element of education technology to the event, the students of ASB created an Augmented Reality (AR) experience on CoSpaces with Merge Cube to view the picture book reviews through the phone or tablet. The AR cube brought the stories alive with visuals that could be navigated in real time by turning the cube in hand. Visiting international author of children's books, Julia Cook, spoke to the students about how books teach children to solve problems themselves and are indeed magical in how they change children's lives. Heeru Bhojwani from ASB said, "Talking to the children at the Jarul Award ceremony convinced me that honouring contemporary Indian picture books has provided an opportunity for them to appreciate the value of Indian literature, be proud, and know that there is an Indian children's picture Book award exclusively for them."